Deputy Prime Minister Datin Seri Wan Azizah Wan Ismail message delivered by Dewan Rakyat Deputy Speaker Dato Mohd. Rashid Haron on the upcoming 5G connectivity, only to disclaim it later and gotten a reaction of the latter, in all awkwardness and confusion, followed the perception on the mockery of how things are sorted out and done. 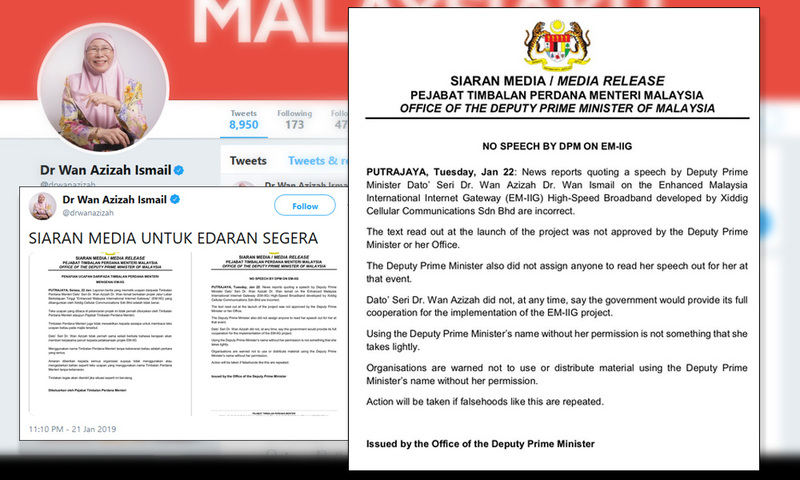 PUTRAJAYA: News reports quoting a speech by Deputy Prime Minister Datuk Seri Dr Wan Azizah Wan Ismail on the Enhanced Malaysia International Internet Gateway (EM-IIG) High-Speed Broadband developed by Xiddig Cellular Communications Sdn Bhd are incorrect. The Deputy Prime Minister’s Office said the text read out at the launch of the project was not approved by the deputy prime minister or her office, adding Dr Wan Azizah did not assign anyone to read her speech out for her at that event held in Shah Alam today. “Datuk Seri Dr Wan Azizah did not, at any time, say the government would provide its full cooperation for the implementation of the EM-IIG project. Using the Deputy Prime Minister’s name without her permission is not something that she takes lightly. “Organisations are warned not to use or distribute material using the Deputy Prime Minister’s name without her permission. Action will be taken if falsehoods like this are repeated,” said the DPM’s Office in a statement today. Several news portal today had reported that Malaysia would have the fastest Internet access speed with the 5G platform in Southeast Asia via EM-IIG High-Speed Broadband that was expected to be up and running in 2022. The deputy prime minister was quoted as saying the RM5.45-billion project encompassed the installation of the world’s largest optical fibre involving a 110,000-km line, adding the first phase of the project was expected to be ready in November, with the Internet line linking Pengerang, Johor, to Putrajaya, where consumers could get a speed of up to one gigabit per second. Deputy Prime Minister Dr Wan Azizah Wan Ismail’s office today claimed her name was misused for a speech at the launch of the Enhanced Malaysia International Internet Gateway (EM-IIG) High-Speed Broadband project. “The text read out at the launch of the project was not approved by the deputy prime minister or her office. “The deputy prime minister also did not assign anyone to read her speech out for her at the event,” it said. The speech was read out by Dewan Rakyat deputy speaker Rashid Hasnon, who is also PKR’s Batu Pahat MP, in Kuala Lumpur, today. The speech, purportedly read out on behalf of Wan Azizah, had said the government would provide full cooperation on the implementation of the EM-IIG project. The speech was reported by national news agency Bernama, which has since retracted the story. “Wan Azizah did not, at any time, say the government would provide its full cooperation for the implementation of the EM-IIG project. “Using the deputy prime minister’s name without her permission is not something she takes lightly. “Organisations are warned not to use or distribute material using the deputy prime minister’s name without her permission,” it said. Wan Azizah’s office said action would be taken if such incidents are repeated. The EM-IIG project, developed by Xiddig Cellular Communications Sdn Bhd, is intended to provide “the fastest internet access speed with the 5G platform” through the installation of the world’s largest optical fibre involving 110,000km line. KUALA LUMPUR (Jan 22): Malaysia is to have the fastest Internet access speed with the 5G platform in Southeast Asia via the Enhanced Malaysia International Internet Gateway (EM-IIG) High-Speed Broadband that is expected to be ready in 2022. Deputy Prime Minister Datuk Seri Dr Wan Azizah Wan Ismail said the RM5.45-billion project encompassed the installation of the world’s largest optical fibre involving a 110,000-km line. She said the first phase of the project was expected to be ready in November, with the Internet line linking Pengerang, Johor, to Putrajaya, where consumers can enjoy a speed of up to one gigabit per second. “Now, at a speed of 13 megabits per second, it will take 51 minutes to download a 5GB high-definition video but with the implementation of the project, the video can be downloaded in just eight minutes,” she said in her speech at the launch of the project. The text of her speech was read out by the Deputy Speaker of the Dewan Rakyat, Datuk Mohd Rashid Hasnon. Dr Wan Azizah said that according to cable.co.uk, the Internet speed in Malaysia was ranked 48th with an average speed of only three megabits per second and the speed was still considered unsatisfactory. The EM-IIG, which involved the installation of optical fibre of 150 terabytes, would offer high-speed Internet access at low prices parallel to the government’s preparation towards the Industrial Revolution 4.0, she said. “Alcatel Submarine Networks will install a 7,500-km-long submarine optical fibre from the international Internet hub in Hong Kong to Malaysia and extend it to Thailand, Cambodia, Vietnam and the Philippines. The project will benefit people not only in this country but also subscribers from around the world when the cable is connected to the outside world,” she said. 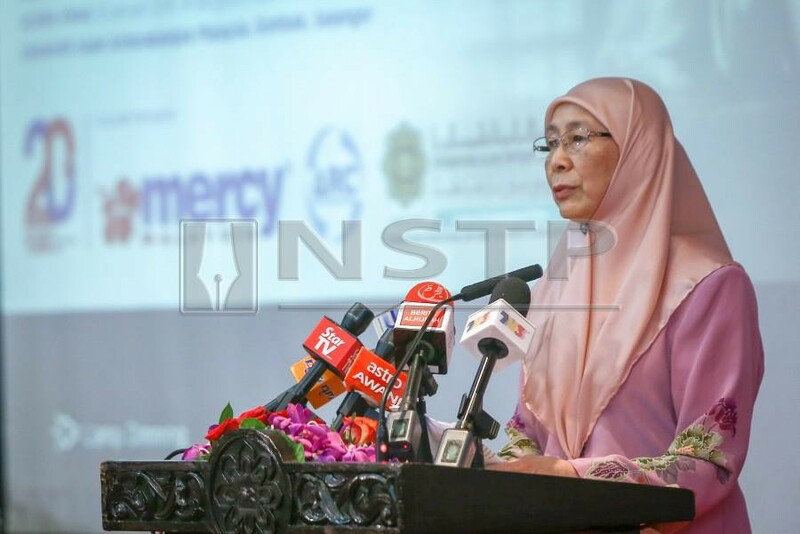 Dr Wan Azizah said the government would provide full cooperation for the implementation of the EM-IIG project because it would assist the growth of new high-tech industries besides generating the economy to raise the country to developed-nation status. The EM-IIG, developed by XiddiG Cellular Communications Sdn Bhd, would reduce the digital gap between the urban and rural areas, she said. As a social responsibility initiative, the company would provide free high-speed Internet service to all government schools, hospitals and health clinics as well as public universities nationwide, she added. This is very embarrassing for the Federal Government in such a very important information and communication policy and delivering a paramount component of the industrial revolution (I.R.) 4.0. If the Deputy Speaker Rashid has been hoodwinked or deceived to deliver a false speech on behalf of Deputy Prime Minister Wan Azizah, then a mere statement demanding an explanation from the organisers is considered mild. The delivery was in the presence of media and it was rightfully reported nationwide, quite soon after it was delivered. It is the onus of Deputy Speaker Rashid to make a Police Report and let the Commercial Criminal Investigation Department to work on sorting out the mess if not mockery deliverance of statement. Media exchanges would just confuse the public even more. After all, Deputy Speaker is a post in the esteem office of the legislative branch of His Majesty’s Federal Government. Even is it is filled by an elected representative through political democracy process, the Deputy Speaker should not be behaving and/or acting like other politicians.